When I was younger I never knew just how important beauty products would be to me; From tweezers to the new talked about mascara (It's always something new), but here we are, I'm 23 years old and my night time routine has been taken over by creams, cleansers and face masks; My morning routine involves make up and hair care, my life has became filled with beauty products from morning to night. Before this post I never really though about how much I use beauty products, it hardly ever crossed my mind, if ever and now I'm kind of shocked with everything that I do actually use. With that in mind, it's no wonder I'm always lusting over new foundations or facial cleansers, it feels like a necessity now that I shouldn't have to live without.... Writing this down really makes me feel superficial in a way because as a little girl I was always happy and content in my own skin and now with all the blogs, magazines and media that is out there targeting skin care products, make up and everything else it's near impossible for me to avoid buying a new cream geared towards making my skin glow. With all that being said, this is my beauty wish list, all the things I'm currently lusting after and pray to own very soon (Ok, I probably won't own it all, but a girl can dream right?) A complete lust induced post. As you can see most of it is make up (apart from the lush products) I am so into my make up right now that I am lusting after so many beautiful products! My ultimate faviourite from the list is the PUFF OFF eye cream by Benefit, I have heard so many good things about it plus I have been meaning to get a good eye cream for a while so this should go me good. What are your current faviourite beauty products? Lush masks are amazing! I love them for a pamper night. Lipgloss is always a winner for me and love the naked pallet. Oooh loving the smokey eye shadow palette - I have a similar one by Urban Decay it's my go to for evenings out! I don't wear make up, but I do love Lush products, and living in France, the pharmacies are brilliant here, I'm a total convert to Bioderma, BTW love the post. Lovely beauty products you got here. I need to try the Naked palette. 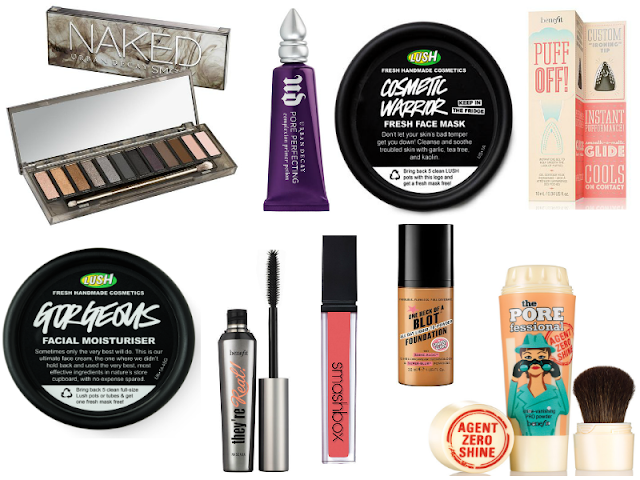 As a guy it always amazes me just how many beauty products are available! I love Miscellar water I think it is a beauty essential that we should all use!